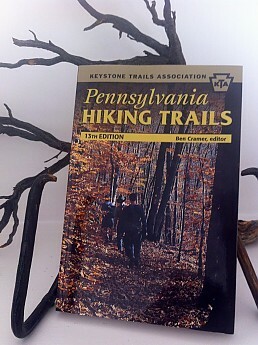 This is Keystone Trails Association's catch-all book for Pennsylvania hiking trails. 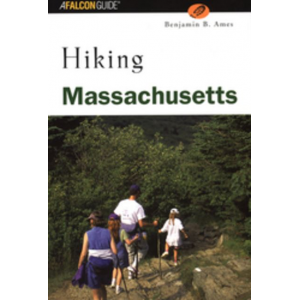 It is not meant to serve as a guidebook for any specific trail, but instead, its purpose is to introduce hikers to a variety of trails throughout the state — variety in length, difficulty, geographic features and region. 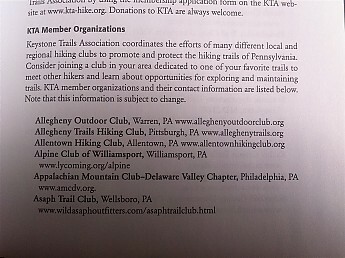 Keystone Trails Association (KTA) is a venerable organization that works with hiking clubs, volunteers, and government agencies to protect and advocate for PA trails. In doing so, they have gained a fair amount of respect throughout the state as a leading voice for trail users. It may be important to note here that I am not a KTA member. Here is the front cover to the 13th edition of Pennsylvania Hiking Trails by Keystone Trails Association. The cover's photography isn't exactly breathtaking nor inspirational. Instead they chose an everyday ordinary type PA trail in the autumn. That's fine, I guess. This book's layout is intuitive for me. As a reference book, it is easy to locate what you're looking for without thumbing back and forth to find something you previously read. The generous whitespace throughout the book is handy for making personal notes. After hiking a trail in the book, beside the trail description I typically write the date I hiked it, weather and trail conditions, and whether or not there were any tricky navigation spots, either on the trail or on the road getting to the trailhead. Plenty of whitespace is provided for all this info and more. I won't go into detail regarding each section, but here is a look at how the book is divided up. Number of entries per section are in parentheses. This number does not necessarily equate to the number of trails mentioned, because some entries have multiple trails highlighted (eg: some state parks with multiple trails). A map that shows the state divided into nine geographic regions. The two sections I want to highlight are the Introduction and the Long-Distance Trails sections. This has a nice explanation of the philosophy behind the book, some basics of hiking safety, etiquette and backcountry camping, general info on KTA and a long list of its member hiking/outdoor clubs throughout the state and their contact info. 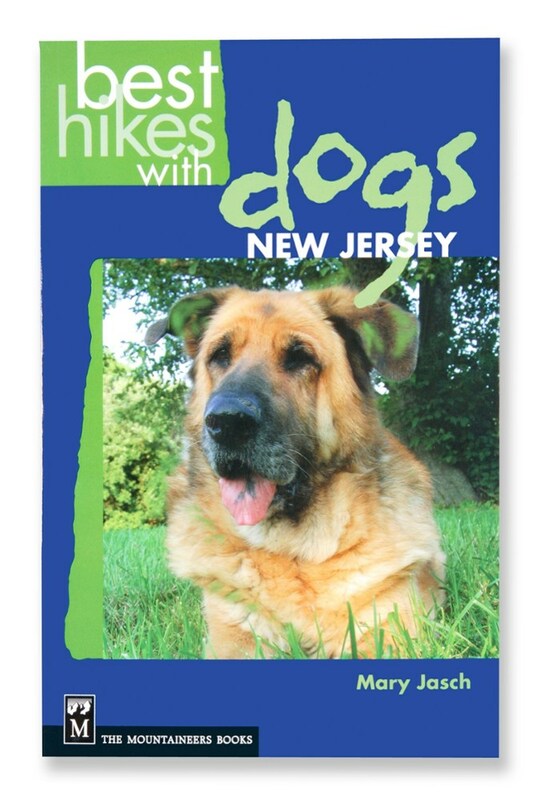 The introduction does a lot more than just say general things like "Hiking in PA is fun!" Instead, the intro is well thought out and properly sets the stage for the book. The one part of the introduction I don't care for is the "Information on Maps." This is an 8-paragraph explanation/justification for why the maps in the book are of poor quality. Essentially they note that good maps of large areas cannot be printed on single book pages and that there are many free or low-cost, highly detailed maps available through various state agencies or hiking clubs. This explanation is useful and well understood, but in my opinion, it would be more useful to either include a bit more detail in the maps or just scrap them altogether (more on this later). 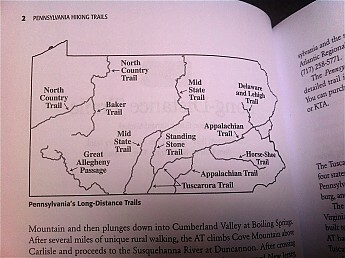 A map that shows the long-distance trails of PA. Many of these continue into neighboring states. While I completely agree with the editor's stance on not cramming the book with maps because of the ease in which one can access a good map for most of the trails mentioned, I do however, still have an issue with the handful of trail maps that are in the book. There are some inconsistencies with town names (e.g. some are written in small caps, others are not. Some are circled, others are not). There is no key, nor any mileage on the maps. But my biggest issue with maps are the lines used. The ones used for roads and trails are so similar in size and the exact same color (black) that it's hard to tell which is which on some of the maps. If my counting is correct, this book has 20 trail maps. There are 282 entires, which highlight more than 300 trails, so it's pretty obvious that this is a text-based book. I think the book would be better off without the maps and instead include some high-quality photography from the trails. 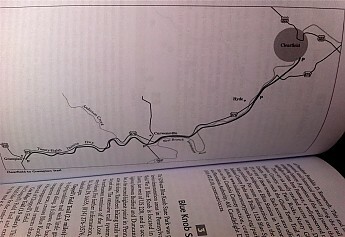 Here is one of the 20 or so trail maps in the book. Not very detailed, no key, and hard to distinguish the features. Although the book has a thoughtful disclaimer that it has no intentions of having stellar maps, I would suggest doing away with these trail maps altogether. 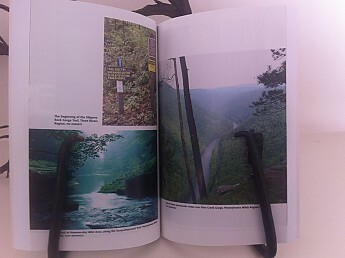 There is a small 8-page section in the middle of the book that has some photography from various trails. However, like the front cover, this photography is nothing extraordinary. Two of the 8 pages that include various trail photos. These 2 pages easily have the highest quality photos in the book, and even then, they are not overly impressive. While some state parks that are mentioned do have numerous trails listed with lengths and difficulty level, other state parks and forests that host a slew of trails only get one paragraph with very little description (e.g. Little Pine SP and Tiadaghton SF). There is an abundance of statements similar to the following, "A substaintial loop hike of 8.3 miles in the remote western section of the park is described in '50 Hikes in Western Pennsylvania' (2000), by Tom Thwaites." Actually, to prove my point, I just randomly opened the book and found the first Tom Thwaites reference I could. Unsurprisingly, it was on the very page I opened to. Mr. Thwaites is a renowned trail hiker, builder, scout, advocate and editor of one of the sections in the book. For many years, was the faculty advisor of the Penn State Outing Club. I've never met him, but I know of his legendary status. He is so respected in PA that a part of the Mid State Trail was dedicated in his honor and the T-Squared Trail that connects Donut Hole and Black Forest Trails is named after him. 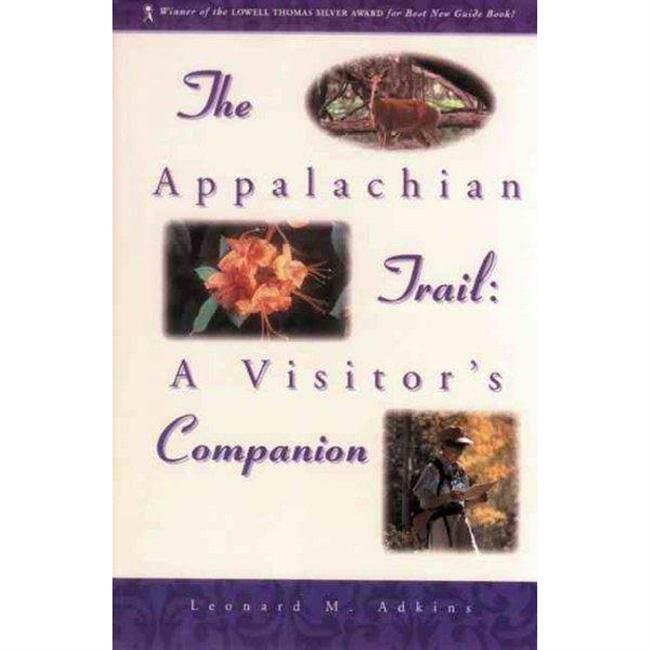 This guy is certainly the real deal and has put together many great books about hiking in PA. My issue is not that they reference Mr. Thwaites (because his books are probably the most authoritative to reference) but it's to the extent in which they do so. It seems to me that some trail descriptions are cut short and end with statements to go read Mr. Thwaites's books. Each region is put together by a different person, typically a long-time KTA member who resides in the region they represent. Their bios are found near the end of the book, along with the bio of the book's overall editor. Most of their bios include what local hiking/outdoor club they belong to, so I assume it wouldn't be hard to track down contact info if need be. It's reassuring knowing the info in this book is from local knowledge. Other helpful features include the KTA membership list and the well put together index. 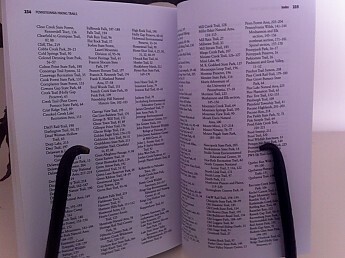 The book includes a list of the 50+ KTA member clubs/organizations throughout the state. This is helpful for the purposes of connecting with local clubs. An easy to use index is helpful when needing to locate a certain trail, especially given that many trails share similar names. 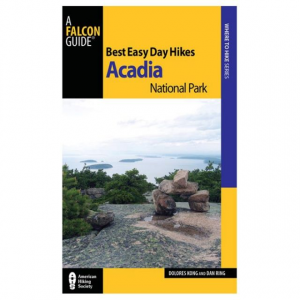 The KTA claims, "This book is meant to create interest among hikers in the trails described and lead them to explore more hiking opportunities." I think this book accomplishes that claim rather well. From me, I have used this book numerous times as a reference to find new trails or remind me of trails in a certain area. I never solely use the info provided in this book before hiking a trail, but it does get me started in the right direction. 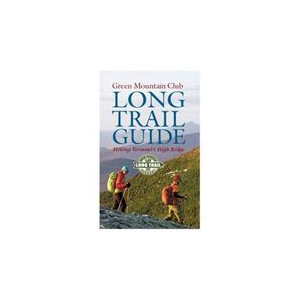 I have also connected with area outdoor clubs that I found mentioned in this book. 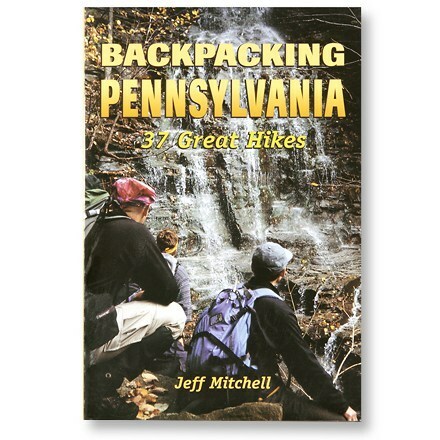 I would suggest the ideal user of this book is someone who is either new to PA, new to hiking in PA, or interested in exploring new areas of PA. The biggest improvement I think KTA can make in future editions of this book is to make the photography more interesting and more plentiful. As we become more and more visual creatures and good-quality photography equipment becomes less and less expensive, I think a healthy dose of photography will do more to entice people to hit the trails mentioned. Scrap the mediocre maps and replace them with high-quality photos. Nice review, KiwiKlimber. Thanks for sharing it. Thanks Alicia and Goose. Your comments are encouraging for this Trailspace newbie. I wasn't entirely sure if reviewing a trail book was okay, but I noticed others had. I actually read some of Rick-Pittsburgh's old stuff and was inspired to write this review. This is very helpful. 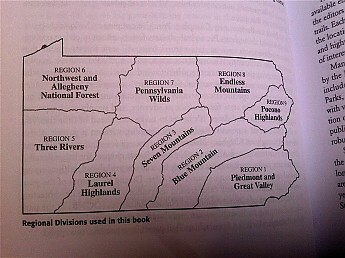 Should I ever head out to PA, I now know a book to buy in advance of that trip! @KiwiKlimber I will be hiking with Rick Pittsburg this summer on the LHHT. I'll tell him you find his reviews helpful...By the way Nice review.. Thanks Denis. I love the Laurel Highlands. I am actually heading that way this weekend to volunteer at a mountain bike race. Lovely area. You'll enjoy it, no doubt. Thanks for passing along my praises for Rick-Pittsburgh's reviews. I wish I had joined Trailspace sooner so I could have told him myself. I visit Pittsburgh all the time. Oh well. Thanks. I didn't know about the Facebook group. I just purchased this book on ebay for $3 - . I have family that recently moved to the Poconos area (and we have been considering moving there as well). Maybe I haven't searched hard enough, but I haven't found much good info about hiking/backpacking in the area. I hope this book will help with what I like to do. Thanks for the review KiwiKlimber. Great to hear, Bkuti. Hope you found the most recent 13th edition of the book. The Poconos are a pretty unique area of PA. Lots of resemblance to areas much farther north with tons of bogs and kettle lakes, not typically associated with PA. So close to NYC and Philly, yet never developed in the way that much of the surrounding areas were. The Poconos have lots of state parks, forests and game lands so hiking opportunities certainly exist, but it does lack any of the more recognized, long-distance trails that other parts of the state claim. Hope the book helps. I'd also contact the Pocono Outdoor Club if I were you. Yes, I got the 13th edition. 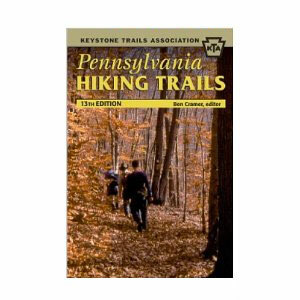 The Keystone Trails Association Pennsylvania Hiking Trails: 13th Edition is not available from the stores we monitor.